For the right match, the right flow rate...Fisrt time, every time. 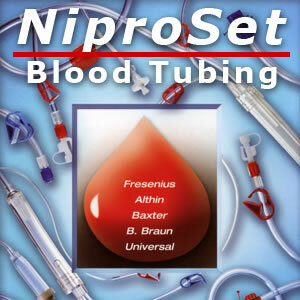 All NiproSet tubing is designed to enhance safety and efficiency, with all sets individually pre-labeled based on equipment compatibility. To help ensure the quality you expect, Nipro manufactures a complete line of all tubing components, which are tested according to FDA specifications. 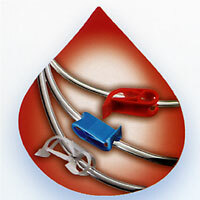 Patient safety is enhanced with clamps that are color-coded for confident identification of the appropriate line. Factory-applied torque helps prevent loosening or disconnecting of transducer; engineered to maintain monitoring while decreasing exposure to the dialysis machine. 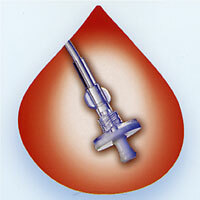 Drip chambers feature a versatile medication port and, for an extra measure of safety, are anti-foaming to minimize splashing. • Patient Connector: The male lock connector assures the connection to the fistula needle. 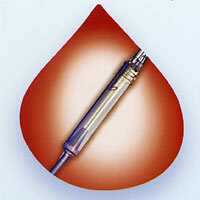 • Pump Segment: Available in various diameter sizes to suit each specific dialysis machine. • Recirculation Connector: The connector helps simplify safe priming operation. NiproSet clear PVC tubing is designed to withstand pressure and manipulation without compromising flow rate accuracy and consistency, regardless of equipment used. 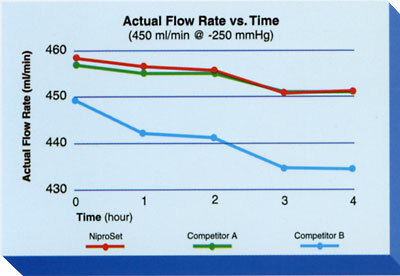 Laboratory testing demonstrated that when compared with two leading brands of blood tubing, NiproSet delivered an accurate and consistent flow rate over time. 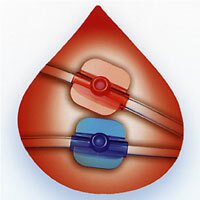 NiproSet blood lines have demonstrated excellent performance under conditions of higher than normal flow rates and pressure in the dialysis circuit. 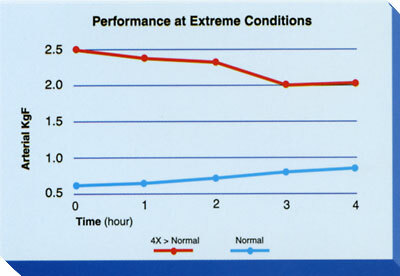 No failures were reported in the blood lines tested in any of the extreme upper limits. Blood and foam never entered the pressure monitor lines and no strike through occurred.